US Army Sgt. Joshua Adkins from Williamsville, N.Y., helps Spc. 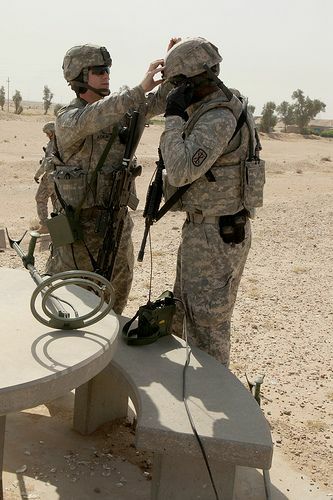 Julius Thomas from Grandview, Mo., attached to the Guardians Maneuver Element, 17th Fires Brigade get his equipment on during a patrol in Basra, Iraq, on June 4. Photo via the US Army.